At 7pm tonight (16/3/19), a member of AWSM, as well as representatives of other political, religious and ethnic groupings, attended a one hour candlelight vigil in Rotorua in the central North Island, for the victims of the fascist terrorist incident in Christchurch. 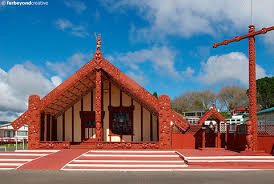 Approximately 500 people from the local community gathered for the vigil at the grounds of the marae/meeting place of the Ngati Whakaue tribe in the village of Ohinemutu near the shores of Lake Rotorua. A series of rostered speakers gave expressions of aroha/love and solidarity for the victims, which was followed by an open mic. This included impromptu waiata/songs and speeches. A number of the people who took advantage of the latter and shared their korero/speeches, were from ethnic minority and religious groupings including Muslim, Sikh, Hindu and Christians as well as local rangatahi/youth of various ages. The proceedings took place in an appropriate atmosphere of both solemnity and grieving for the dead and injured, though this was marred at times by an unreflective ‘Little Kiwi’ nationalistic exceptionalism. In the days to come it is hoped this aspect of any events disappears or at the very least is greatly weakened in preference for an acceptance that Aotearoa is really no different to anywhere else on the planet in terms of suffering from and perpetrating the same social and political pathologies experienced elsewhere. The proceedings took place in an appropriate atmosphere of both solemnity and grieving for the dead and injured, though this was marred at times by an unreflective ‘Little Kiwi’ nationalistic exceptionalism.